Note: Andy Preece of GoBike has produced this excellent annotated map of the ride including the bonus section we didn't manage to cover - which may help those people whose grasp of Glasgow's geography is about the same as mine. On Saturday, Feb 18th - despite a dismal forecast and a wet start - a hardy group of around 15 cyclists gathered to have a look at some of the best and worst of Glasgow's infrastructure, ably guided by Andy Preece of GoBike! Strathclyde and Dave Brennan of magnatom fame. As with pretty much every city in the UK, the impression was of a mix of provision, with short stretches of occasionally good infrastructure mixed in with a lot of ho-hum and some downright dangerous stuff. While some effort has been made and is continuing to be made to join up the isolated patches into more of a network, without a 'native guide' a visitor to the city would have struggled to find what infrastructure there was. Perhaps unsurprisingly, given the patchy weather, we saw very few other cyclists during most of the ride. Being a large group, where there was any infrastructure we tended to overwhelm it - if Glasgow ever gets the 10% modal share for bikes that the Scottish government is supposedly aiming for by 2020 then there will be some serious bike congestion on the narrower routes. We started on West Nile Street and headed north to join the Colleges route. The first piece of infrastructure beside some rather faded bike lanes was this cut through on the junction of Dunblane Street and McPhater street. The road had been made no entry for cars, although the rest of the road was a two way street, and the cut through added, but without any actual indication that it was okay for bikes to use it (looks like drainage might be an issue too). This is the sort of thing that can contribute to the impression that cyclists break the rules of the road - and at the very least suggests a lack of attention to detail in designing cycle facilities. On the other hand, it is a nice example of using lack of permeability for cars to reduce rat-running traffic with pragmatic permeability for bikes and pedestrians. We then joined a nice wide cycleway (technically a shared use path but the cycle way provided a different surface to the pavement) between Cowcaddens and Braid Square and took an underpass under the M8. This was a good example of providing social safety - underpasses are not generally welcoming spots but its width, the brightly coloured tarmac, good sightlines and jolly sculptures made this a place that felt cared for and hence a safer place to be (more here). North Woodside Road is another good example of selective permeability - cars cannot turn off Maryhill Road in either direction onto it, but bikes and pedestrians can. This time there are signs and bike paths making it clear bikes are permitted, although you're rather on your own crossing the busy main road. In North Kelvinside, there was more selective permeability with residential streets like Striven Gardens, Doune Gardens and Doune Quadrant interrupted along their length with gates which bikes could filter through with care. Unfortunately, the pressure on parking had overwhelmed the space available making filtering even more tricky and slowing bikes down - not particularly welcome if this was on your commute. We then joined the Forth and Clyde canal for a section to sample some off-road cycling. This was quite narrow in places and muddy in others and completely unlit. One of our party admitted that she left work early in the winter because this was on her route home and she didn't fancy cycling it in the dark. Unfortunately, lots of off-road provision that would otherwise be extremely attractive to female or family cyclists are similarly out of bounds during the shorter months. Even in daylight, where the track was unsurfaced (mostly it had been improved) heavy rain could render the path unusable. Once we'd crossed the canal we 'manned up' and rejoined the Maryhill Road (the A81). The main facility here was an entirely vestigal shared use pathway alongside the 50mph dual carriageway with almost no signs warning pedestrians, no markings on the pavement, and narrowing of the pavement at bus stops, making conflict between passengers and cyclists almost inevitable. Most cyclists apparently ignore it, finding another route or just cycling on the road. This is probably wise as the shared use path ends ambiguously, probably at the point where Glasgow proper gives way to East Dunbarton. At that point we were on our own, rejoining traffic to make a right turn up towards Milngavie Road. 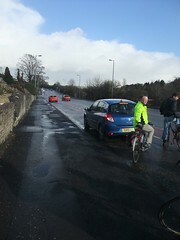 Milngavie Road is home of East Dumbarton's first ever cycle lane and also featured in this video and blog post by Magnatom . 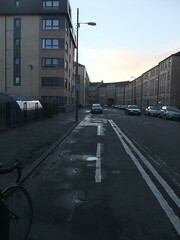 The lane is a reasonably wide advisory lane, very poorly surfaced (in fairness, so was the rest of the road) which runs to the outside of a lane of parking for the residents of the road. This does mean the lane doesn't disappear under parked cars but instead places cyclists in the door zone, on a very fast wide road, which can be lethal. Not only that, but drivers who are hunting for a parking spot may dart into a gap that opens up without even thinking about the fact that they're crossing a bike lane. Cars coming out of side junctions invariably nose out onto the lane because parked cars block their view of oncoming traffic. The way the bike lane curves in and out of traffic encourages cyclists to weave (sometimes without checking what's behind them) and also makes for some nice sweeping lines on the roads, encouraging cars to take the turnings at speed. Moving the parking to the outside of a separated cycle track would mean bikes were largely out of the door zone, and could escape onto the pavement if they had to. Moving the lane inwards at junctions would allow cars to cross the (humped) track first - giving way to cyclists - and only then have to consider oncoming road traffic. Tighter bends would mean cars coming off the main road would have to take the turn slowly and also give way to cyclists. Ideally, the tracks on each side of the road would be one-way - there's plenty of space. In order to make it easier for passengers to get into the car, especially children, there should be a buffer zone between the car parking and the bike lane, which also reduces the chances of 'dooring' a cyclist. After lunch, a smaller group took a much calmer route back using off-road and segregated infrastructure as much as possible. The Garscube Sports Complex took us past playing fields on narrow access roads that were effectively traffic-free but also provided with lighting. The presence of floodlit playing fields suggested that people might be around after dark, making the whole area more attractive for lone or vulnerable cyclists to use. After that, we took the Kelvin walk/cycleway along the river and through Kelvingrove Park. This was clearly a well-used walking path popular with families and dogwalkers. Even though we were a much reduced group by this time, it was almost impossible to keep together as we had to filter (slowly and politely!) past large groups enjoying a Saturday stroll. Interestingly, we saw few cyclists despite the weather having improved. In places the path was very narrow, with many little bridges, ups and downs, chicanes and tight bends. Although it was a relief to be away from traffic, it was impossible to move at any speed without inconveniencing other users of the park and there was no lighting, again making it an unwelcoming spot after dark. While a good place to work on your single-track mountain biking skills, it would be infuriating if it was your daily commute and you were in a hurry. We then crossed out of Kelvingrove Park and onto the new Connect2 cycle tracks (which have been covered by Joe Dunckley here and here). Crossing Sauchiehall Street there is a detector for cyclists which goes red, indicating that your presence has been noted (picture). Sadly, the lights are still incredibly slow to change, to the point where we wondered whether it wasn't just some elaborate practical joke. It's a nice idea, let down by the fact that there's no will to give cyclists - or pedestrians, who shared the light cycle - any sort of priority over cars. The Connect 2 tracks are curbed, segregated, two-way paths running alongside a one-way street which have priority over side roads. On the road side, the curbs are less sharply angled than the normal vertical drop, making it marginally more bike friendly. The track even has a yellow box to prevent waiting cars from blocking it when making a turn - a nice use of UK-specific road cues. Unfortunately they are rather narrow - just enough room for two cyclists to pass each other with care. 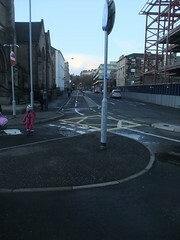 There was also a baffling bit of two-way track that led half way down a one-way street with no exemption for bicycles. Unless you were going to the Gaelic school (where the cycle shelter can be seen on the left), your only option would be to turn around and come back again. This project is continuing, known as the 'Bridge to Nowhere' route, not as an ironic commentary on UK cycling network design, but because it will ultimately reinstate the abandoned bridge over the M8 as a walking and cycling route. 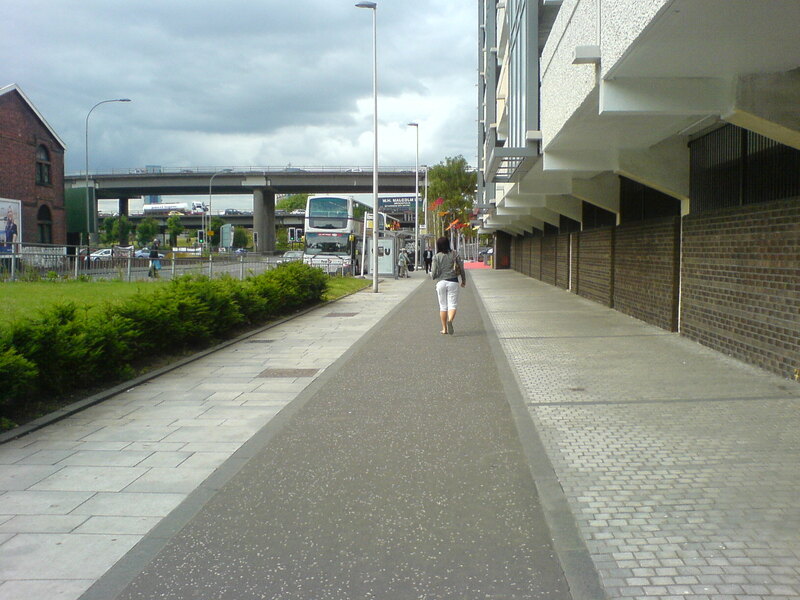 Like much of the UK, Glasgow's cycle infrastructure could be called a tale of two cities. There are pleasant, safe (in daylight hours), traffic-free and traffic-calmed routes available, though not everywhere - but they're circuitious, narrow, slow, obstructed - and often muddy, probably icy in the winter. There are also fast, direct and wide routes - the main roads - but they require confidence, skill and speed to negotiate safely. Apart from the short Connect2 sections (and the bus lane), the two never meet. This is unsurprising, because the distinction between novice and expert riders is built right into the start of the Scottish cycle design guidelines, leading to the idea of a 'dual network'.